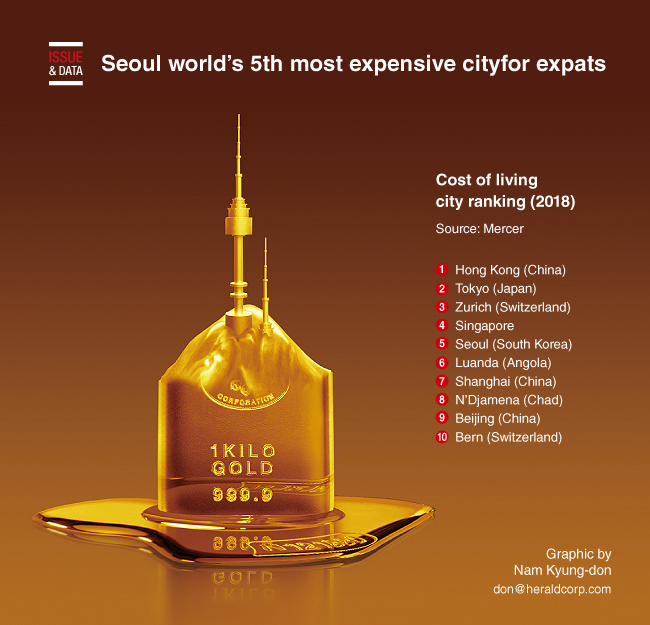 Seoul is the world's fifth most expensive city for expatriates, according to an annual cost of living report by consultancy Mercer. Asia dominates the list, with Hong Kong at the top and Tokyo in second, followed by Singapore in fourth, Shanghai in seventh and Beijing in ninth. Outside of Asia, European and African cities were among the priciest cities for expatriates. Zurich ranked third and Luanda came in sixth. The survey ranked 209 cities across five continents and compared the cost of more than 200 items, including housing, transportation, food and clothing.